Appearing in Copenhagen at the News Xchange annual conference for the international broadcast news industry Farage addressed the audience of around 630 journalists from around the world and promptly sent them into a Twitter frenzy by informing them they were out of touch. Nigel Farage is currently speaking at #NX16 and establishment journalists’ heads are EXPLODING. The conference, which runs until Thursday, is shrouded in something of a sombre mood following the seismic events of the last few months, which have seen Britain vote to leave the European Union (EU) and the election of Donald Trump as America’s next president.
.@Nigel_Farage predicts that there will be less journalists in Europe soon and #nx16 crowd is applauding politely.. WTF?!? Farage, however, was undeterred. He handed BBC journalist Nick Robinson, who was moderating the session, a file from News-watch criticising thousands of hours of BBC broadcasting over the years before going on to spell out that the media must start to reflect the views of their audience on climate change, immigration, the EU and radical Islam, in particular. Farage then joined Charlotte Raab of Agence France Presse, Katy Searle, of BBC News Westminster, Ece Temelkuran, a Turkish writer and journalist, and Jon Williams of ABC [Australian Broadcasting Corporation] News for a panel discussion. Although Temelkuran agreed with Farage that the atmosphere was funereal, the other panelists stuck to establishment lines. Robinson said of Marine Le Pen, the leader of France’s Front National, that she is “widely regarded as a nazi”. Ms. Le Pen is currently the second most hotly tipped person to be France’s next president, behind the Republican candidate François Fillon. 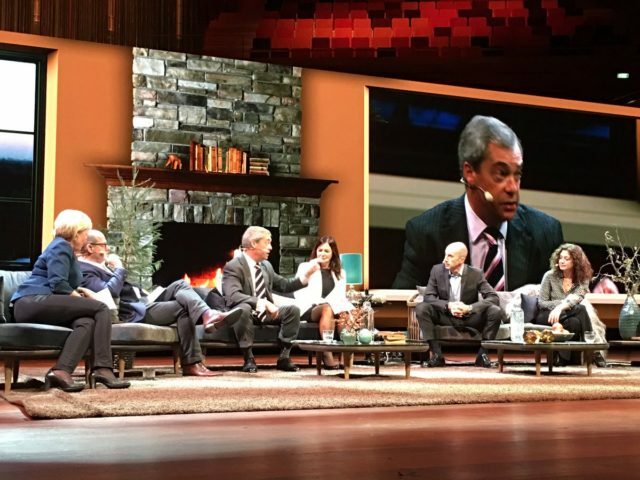 Hardly surprising Farage tells #nx16 that media needs to change. His movement is now in power – and accountable – rather than the upstarts. Very depressing discussion with N. Farage at #NX16, replaying all the known positions. Not sure what it has to do with journalism. Although many traditional news outlets are rapidly losing their audience to new media sites – Britain’s Independent newspaper was forced to cease its print edition and go solely online earlier this year – the audience at News Xchange largely appeared to reject Farage’s advice to listen to their audience. Editor’s Note: This post has been updated to correctly attribute the quote saying Marine Le Pen is “widely regarded as a Nazi” to moderator Nick Robinson, not AFP politics correspondent Charlotte Raab.